About to board the Dolphin Explorer are Massey marine biology researcher and student mentor Karen Stockin (front left) with secondary school pupils (from front left) Audrey Setiawan, Merel Kroonenberg, Shaka Ravishankar (all Rangitoto College), and (back row from left) Donald van der Westhuizen (Long Bay College), Hayden Hamilton (Manurewa High School), Craig Parker (Long Bay College), Laura Goudie (Westlake Girls' High School), Laetitia Kench (Rangitoto College), Fiona McMillan (Long Bay College) and Shannon Fraser (Rangitoto College). The thrill of seeing whales spouting and pods of dolphins swimming at close range on Auckland’s Hauraki Gulf gave secondary school science pupils a vivid sense of life as a marine biologist. Like many Aucklanders the pupils were stunned to find there are whales just kilometres off the North Shore coast between Rangitoto Island and the Coromandel Peninsula. 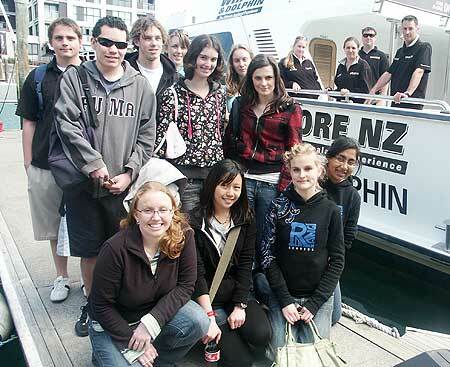 The pupils won vouchers at a recent course advice day on biological sciences for a day out on the Dolphin Explorer – a tourist and research vessel operated by Auckland’s whale and dolphin safari. The five-hour boat trip was more than a joy ride. Organised by marine biologist Karen Stockin, from the Institute of Natural Resources at Massey’s Albany campus, the journey over choppy seas was a unique chance for students to learn about the prolific marine life at their doorstep. This includes marine birds such as gannets, shearwaters and petrels in addition to five Brydes whales and more than 100 common dolphins. While some were beginning to wonder if they would spot a single dolphin after more than an hour at sea, the eventual sighting of a frenzied crowd of dive-bombing gannets and other seabirds gave the clue to where dolphins and whales would be feeding. Pupils braved drenching at the bow for a glimpse of Brydes whales – spotted close to the boat. Ms Stockin, who has recently completed her doctoral thesis on the common dolphin found in the Hauraki Gulf, acted as guide and mentor for the group of 10 students from Rangitoto and Long Bay Colleges, Westlake Girls’ High School and Manurewa High School - all aspiring scientists interested in marine biology, zoology and evolution. She shared fascinating facts and details of the common dolphin’s behaviour and biology, including their voracious appetites resulting from their need to maintain their body temperature in temperate seas and their highly competitive mating and sexual antics. The trip was a follow-up to the course advice day highlighting the extensive biological research being undertaken by New Zealand and international researchers at the institute, as well as the growing opportunities for study and research with the introduction of an undergraduate marine biology paper next year. Ms Stockin, a research officer for the Coastal Marine Research Group,says she is excited about being involved in the expansion of marine research at Massey’s Albany campus. Projects being conducted in both the Coastal Marine and Ecology and Conservation Groups at the campus are growing at an almost exponential rate, she says. 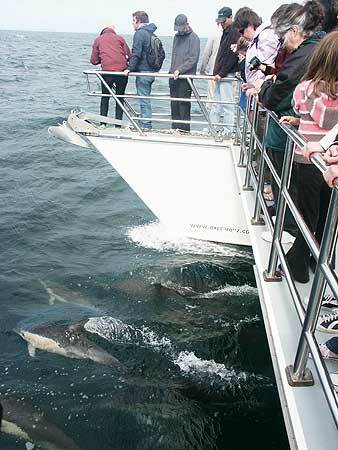 Right: Common dolphins swim with the Dolphin Explorer vessel.